It took a couple of days to do a good job of it, but I have the intakes nearly finished. I rough cut the flanges one at a time with a sabre saw, then clamped them together and ground them to shape as a unit. I marked and drilled one plate, then clamped them together again to drill the mounting holes and a pilot hole for the center. I hole-sawed each center hole separately. I was rolling along so well that I forgot to photograph the pipe cutting and brazing. The “before brazing” photos are actually of the prototype, which you may notice has the pipe off center and does not have the taper referred to next. Anyway, for the pipe, I had already cut a threaded end off, so I slightly tapered that end of the pipe and wire brushed the factory coating off. I used a standard plumbing-type pipe cutter and cut a segment about 1.2 inches long. This makes a rough and slightly distorted end, but it’s square to the end of the pipe. I cleaned up the cut edge on the grinder and set it aside. I clamped the first flange and used a deburring tool to slowly increase the diameter of the center hole until it made an interference fit over the tapered end of the pipe segment. The flange was gently hammered all the way down to the non-tapered end of the pipe segment, making it as flush as possible to the end of the pipe. I then put the assembly on a brick (I recommend a real fire brick for this; my brick will someday pop off shards of hot brick that will land either in my eye or on Toni’s trike. I think I’d prefer it land in my eye, for that would probably hurt me less.) and brazed the seam. My prototype intake was seriously flawed in two ways. Earlier I mentioned that the center hole was not indeed centered. It could theoretically affect the flow of fuel-air mixture, but the net effect would probably be pretty minimal anyway because we’re going from the throttle body into a short rubber reducer, the small end of which is clamped to the intake. The turbulence from a 1/16″ offset would probably not be noticed with all the other obstacles! The other flaw on the prototype is that I attempted to use a standard air-MAPP torch for the brazing. It does get it hot enough, just barely, so it made a good seal and a mechanically sound joint, but it was lumpy. I think I could have suspended it on wire or some such and heated it uniformly enough with that torch to reflow the joint, but I was going to replace the unit it anyway. This time, I used a MAPP-oxygen torch, which gets way hotter. The result is that the piece heats up faster, flows the filler better and does it fast and efficiently enough that the brick isn’t heated all the way through in the process. Then I did three more just like it. The only flaw in the new ones is that the mounting holes ended up ever so slightly too close together, but at least all four are the same! I will slot them a bit and that should be that. What’s left is to surface grind/file/sand the flange face that mates with the engine, apply some black engine paint to hide my beautiful brazing and find gasket material to cut for them and they are ready to bolt on. Author adminPosted on March 25, 2008 August 10, 2018 Categories 1982 Yamaha Maxim XJ550Leave a comment on Intake Fab, Cont. I am going to fabricate intake flanges, hopefully tonight. I picked up most of the hardware I will need at lunch today, namely some 2″ wide bar (I got 1/8″ thick, though I was hoping on 1/4″) and some 1″ pipe. Each flange is basically going to be an appropriately shaped base, with mounting holes drilled in the wings and a large hole in the center. I will cut a short piece of the pipe, fit it to the hole and braze it in place. After grinding/filing/brushing them to finish, I will cut gaskets to fit and bolt them to the engine intakes. I found neoprene plumbing reducers of a suitable size to interface between the intake flanges and the throttle bodies. They are only $4 each, as opposed to $12-$20 each for silicone. Assuming it all works, I will probably replace them with spiffy pretty silicone ones later, but these should do fine for getting Buzz running again. In either case, the rubbery reducers should allow enough flex to account for the spacing differences between the intake tracts and the throttle bodies. I salvaged my fuel pump from an in-tank unit purchased on eBay. The in-tank design has pump, pressure regulator and surge tank (as well as fuel level sensing) in one simple unit, but the whole unit could never fit in the Maxim’s tank. I will have to plumb these pieces together externally. At this point, I have all the tubing I need for hooking up the fuel pump, but I’m short a T to connect the regulator. The regulator basically relieves overpressure by bypassing the excess back to the tank. I need to feed the output of the pump to the T, then connect one side to the throttle body and the other to the regulator. The regulator’s bypass port will be sent back to the tank, which will require adding a return path. I think I can use a weldless bung for that connection. If not, I will need to make the tank safe for brazing heat. This can be done by rinsing it with soapy water and once I’m ready to do that, I may as well apply some tank liner, too. It looks like I will have to fabricate a trigger wheel for my EDIS ignition. There is a company in Britain that sells laser cut ones that would probably fit, but it gets expensive fast. Surely, there is a domestic manufacturer of such things? For a motorcycle, it needs to be a small unit, probably no more than 3″ or so. The smallest from DIYAutotune is 4″. Maybe I need to cut a deal with eMachineShop. I need to stop for the T and some brazing rod on the way home tonight. I will also get a fire extinguisher or two, for beginning probably this weekend, I will be working with liquid fuel under pressure. I took a bunch of pictures that are kind of intended as documentation for reassembly, but some are more interesting. I knew the bike was far from spotless, but digging into the depths reveals how dirty it really is. Yucky. Flash photography also reveals much grime that my eyes seem to overlook. The fitting of the throttle bodies to the engine is the biggest question mark at this point. Of large concern is the width of the throttle body assembly. In a quick eyeballing, it looks like the stepper motor for the subthrottles, something I had intended to leave intact for future expansion, may stick out far enough to hit the rider’s right leg. Also, the throttle cable connects to one end of the TB but connects to the center in the stock rack. At the very least, I’ll probably need a longer cable. I may also be able to install it “upside down” to put the throttle on the other end where it may reach better. I also don’t care too much for the single cable arrangement depending on a spring return, though I have not personally ever had one stick open on me. 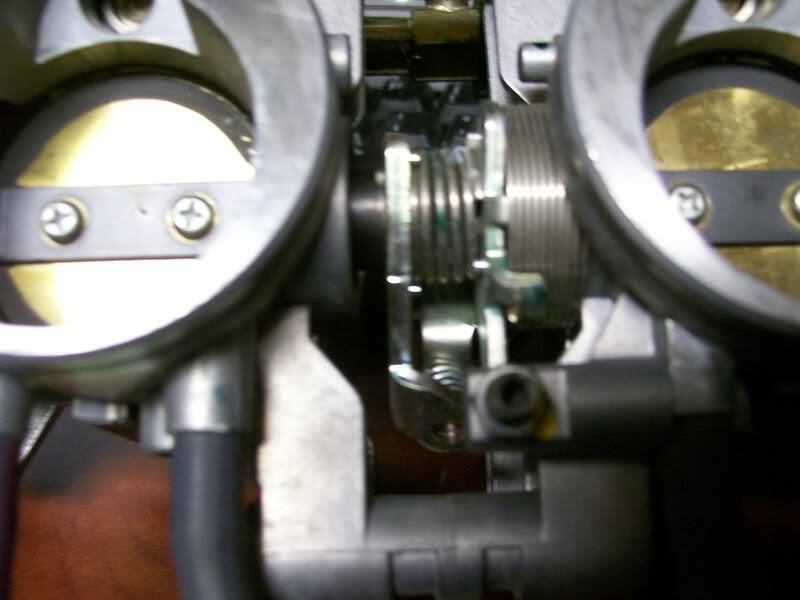 As for connecting the TB to the engine, the photos will reveal a substantial difference in the carburetor throats, or at least where they have to connect. I have found silicone reducers in appropriate sizes, ranging from $12 to $22, usually in blue, but sometimes in black, red or other colors. Purple intakes, anyone? Anyway, using a reducer and custom fabricated intake flanges, I think I’ll have the TB mounted very soon. I have done minimal testing of the fuel pump. It runs and running dry, it pulls a little more than 1A. I really expect that to climb substantially once it’s pushing fluid under working pressure. I hope to test that tonight, for the power budget is still the most likely reason for the project to go south and the fuel pump is the power hog. I had originally thought I would leave the stock ignition system in place, and I probably still could, but I have picked up an EDIS-4 module for which I need only the ignition coil(s) to complete. I am about 94.7% sure that a 4 tower coil for the EDIS module will fit where the stock coils are, perhaps with room to spare. The biggest questions here are whether the stock VR sensor will pick up my trigger wheel and of course whether a 4″ COTS trigger wheel will fit or if I will have to fabricate one. I hope to be mounting the controller and most of the components in the space where the airbox was. One problem to solve will be replacing the sidecover mounting studs that were on the airbox. All 4 of them are pretty close to a frame piece, so I think I’ll be able to come up with something for them. Well, if I get some answers tonight, I will let you know! Author adminPosted on March 20, 2008 August 10, 2018 Categories 1982 Yamaha Maxim XJ550Leave a comment on Buzz comes apart! I got my harness in, salvaged a few connectors and spun my own harness. I’ve come to the conclusion that the MegaSquirt controller, as built, will not hide anywhere on a 1982 Maxim 550. At this point, I have seem to have three choices. Switch to MicroSquirt; in the long run, probably the best idea. The MicroSquirt is pretty much intended for motorcycle use, being small and sealed. It is also $400. Repackage the controller I have; not a terribly bad idea. There is a lot of wasted space in the box. It could be a little thicker than half of what it is now and that might get it into the “trunk”. I’ll still have to find a place for the (as yet unknown dimensioned) fuel pump and all those relays and such, but maybe that won’t be as bad as I think. Remove the airbox, put on some pods and use the copious space that frees up; This is a pretty common mod for bikes, though I must admit I haven’t seen it done with many Maxims. The biggest drawback I see immediately is that the side covers attach at least partly to the airbox, so I’ll have to come up with some kind of bracket to replace that function. A lesser issue, but one worth attending to, is that the throttle bodies would lose the support that the airbox affords. The throttle bodies have a bracket that was pretty obviously used to mount them to some sort of support on the original bike. I should be able to utilize this. As for the carburetor to throttle body swap, the carbs appear to be 67mm apart for 1&2 and 3&4, but 80mm for 2&3. I was guessing about 10mm just eyeballing it. If I elect to lose the airbox, it might make it slightly easier to add a spacer between the two banks and kind of ignore the 3mm difference between the fixed TBs. I could not get my calipers between the boot and the body of the carb to get an accurate measurement but I would guess that the OD of the carb throat to be 32-38mm, whereas my TB is 57mm. Ouch. I have my eBay eyes on other TBs, just in case. 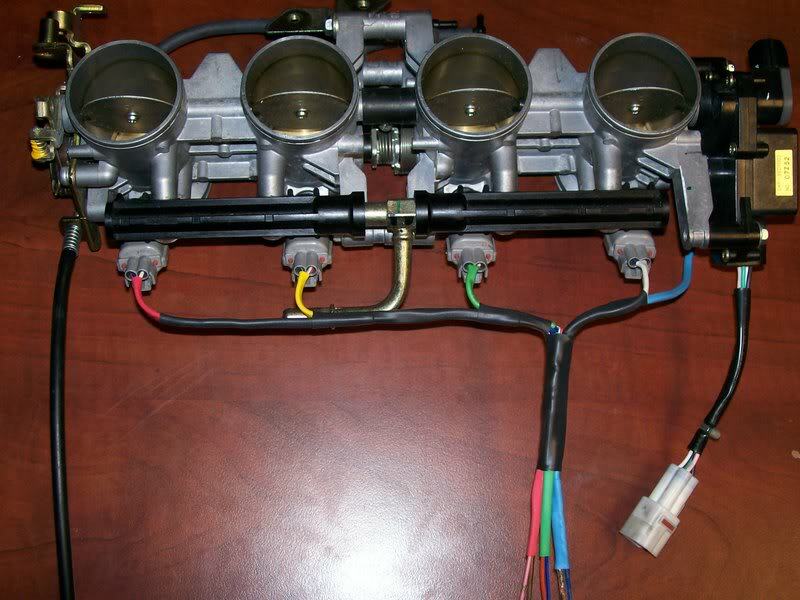 I just found a complete engine wiring harness on eBay for an ’03 Kawasaki ZX636, from whence came my throttle bodies, for less than the cost of 4 Bosch injector connectors, including shipping! Author adminPosted on January 22, 2008 February 21, 2016 Categories 1982 Yamaha Maxim XJ550Leave a comment on News Flash! I now have another bike to use for daily transportation, so the Maxim can afford to be apart on occasion! Also, since the Vulcan has a name (Ruby; so named before I knew the color was called Ruby Red), we decided the Maxim needs a name, too. He is henceforth known as Buzz. I have not yet removed the carburetor bank from the bike, but I’ve taken some informal measurements and have verified something I suspected, that the distance between the intake tracts for cylinders 2 and 3 is wider than between 1 & 2 and between 3 & 4. 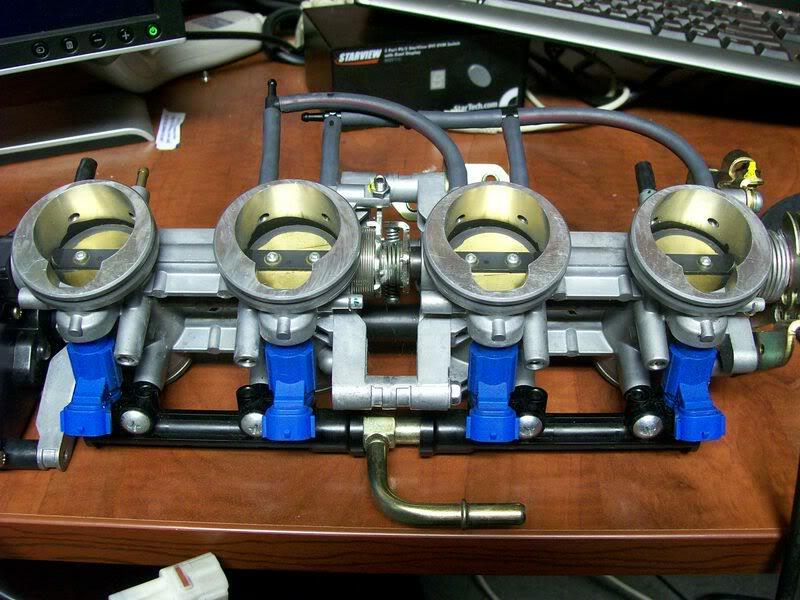 All four of my throttle bodies are, however, evenly spaced. Another potentially big problem is that the OD for the engine side of the carburetors and the the TBs is substantially different. These two taken together mean that I will probably need to fabricate new intake tracts. I have a couple of ideas. I will share them as I develop them! The search for a suitable fuel pump goes on, with little luck. “Suitable” in this case means an external pump that doesn’t pull more juice than my Maxim’s little 200W alternator can provide. There are lots of salvage in-tank pumps from modern fuel injected bikes available and I may be able to re-plumb one for external use. I’ll have to lay my hands on one to see. On the XJ owners list, there has been a lot of discussion concerning the use of LED bulb replacement and HID headlights in older bikes and this may be a way to help keep power consumption in check. I have been interested in fuel injection for a long time and was mystified by the mythos of this black magic when I was in high school. I had always assumed that it was beyond mere mortals. As years went by and I’ve gotten into robotics and other motion control applications, I began to realize that, fundamentally, EFI is not really so scary afterall. It’s not trivial, but it’s not scary. 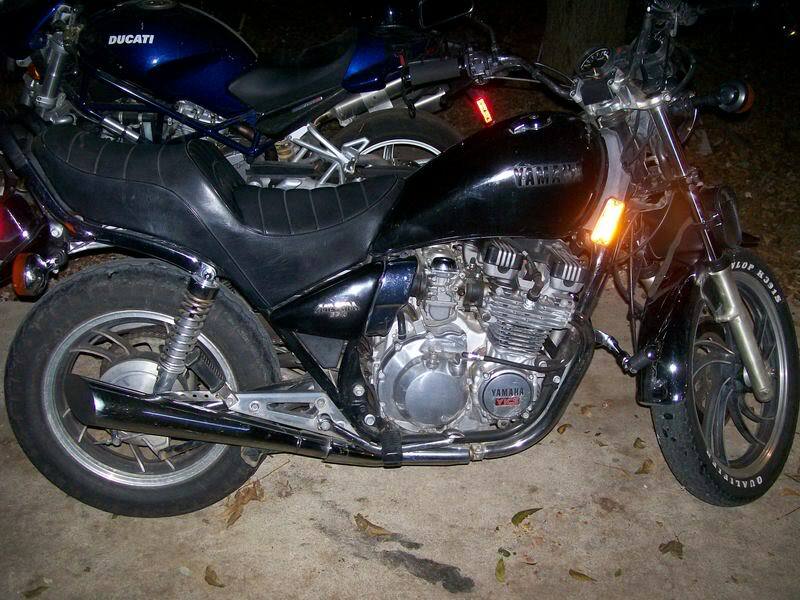 As luck would have it, I bought an ’82 XJ550 Maxim in November 2007. It is in pretty good shape beyond the usual and expected 26-year-old-bike issues. The only problem is that it’s a little cold natured, as the entire XJ line tends to be. In my case, it doesn’t have to be very cold before it will just crank and crank and not start. 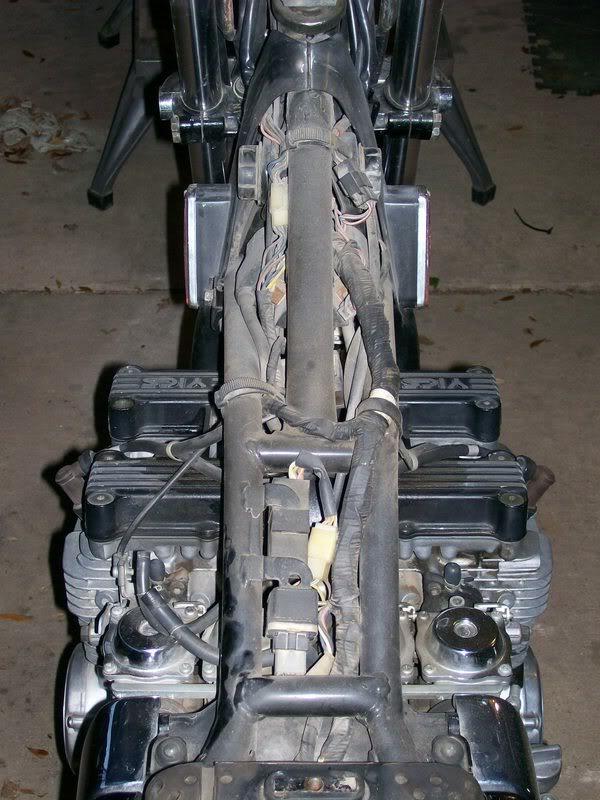 I was researching cold starting problems and found where someone had MegaSquirted their XJ1100. While it’s probably overkill for just the cold starting problem, I am so ready to do it for tinkering sake! I also found solutions that have transformed the “impossible to start when it’s cold” issues into “grumpy about starting when it’s cold but it will do it”. Even so, I have been shopping and the first part has arrived, throttle bodies. I found a set of Keihin throttle bodies from a 2003 Kawasaki ZX636R on eBay and got them for the opening bid plus shipping, $45. They are spotless. The only gasoline smell detectable is by sticking the fuel rail connection in my nose and sniffing. 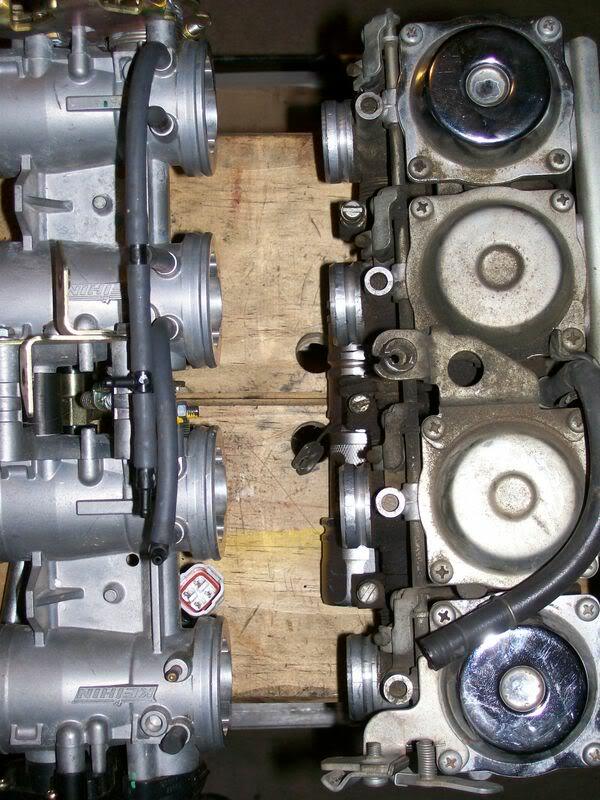 The first issue I know of right away, and I predicted this one during my research, is that the throttle bodies are all evenly spaced with the throttle cable eccentric on one end, but the XJ550 carburetors have the throttle cable in the center and the two center carbs are slightly farther apart. I don’t know at this writing if the intake flanges on the cylinder head are spaced evenly or to match the carbs. The Keihins are really made from two castings with two TBs each, bolted together in the center. The link between the two TBs is spring loaded and adjustable for synchronization purposes, but this link may tolerate some small degree of lateral reconfiguration. Hopefully, the fuel rail will likewise be forgiving. If so, I’ll bet I can come very close to getting these TBs on the XJ without irreversibly modifying the intake tract. 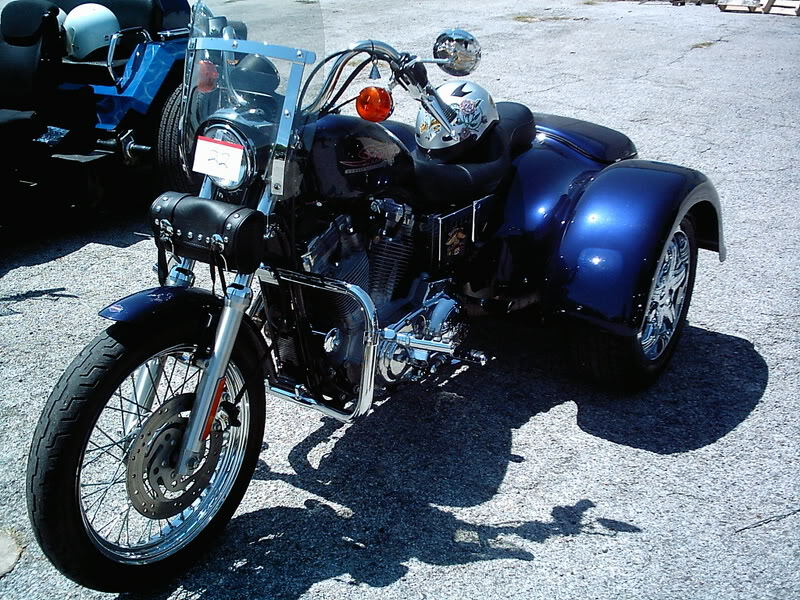 I would like to keep the bike as stock as possible for restoring the carburetors should the need arise.